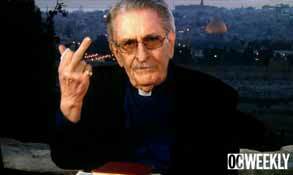 TBN’S PAUL CROUCH FLIPPING OFF HIS CRITICS? Since we came online at the end of August 2005 as a pioneer in the field of Internet apologetics and discernment work Apprising Ministries has, sadly, been documenting The Falling Away Of The Evangelical Church. A main bit of apostasy happening right now is the mainstreaming of Word Faith heretics like T.D. Jakes into the heart of the evangelical community e.g. through the Elephant Room 2 of James MacDonald and Mark Driscoll. We also see an example of this syncretism in pieces Southern Baptist David Jeremiah Praises “Vision God” Gave To TBN’s Paul Crouch and Elephant Room 2’s T.D. Jakes Praising Paul And Jan Crouch on TBN 7-10-12. The reason the latter’s important is that date is well after MacDonald tried to get us to believe Jakes was moving away from WF mythology. With this in mind, today A Little Leaven has a new rather peculiar exhibit. They say a picture is worth a thousand words. 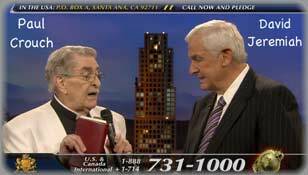 But, this picture of Paul Crouch of TBN only brings two words to mind and they’re out of place for someone who is supposedly a teacher of God’s Word. First of all, if it wasn’t for things like Elephant Room Vet Steven Furtick Excited To Be On TBN’s Haven Of Heretics Tonight a couple of weeks back what Paul Crouch did, or didn’t do, would not be news worthy. You do need to realize that these WF wingnuts are gaining credibility within evangelical circles because of promotion and endorsement of people like David Jeremiah and Seeker Driven prophet-leader Steven Furtick. Secondly, we have little reason to doubt that this photo of Crouch is genuine. The reason I say this is the picture was posted by Gustavo Arellano on the OC Weekly blog, which I don’t recommend and warn you is very secular. what they say is an undoctored photo Paul flipping off TBN cameras in Jerusalem last month. See, I couldn’t believe the picture at first, figuring it was too good to be true. Like, why was Crouch wearing a cleric’s collar in the leaked photo? By the way, that’s heretical WF prosperity preacher Joseph Prince on the left and Paul Crouch’s son Matt on the right. Whether the photo was doctored or the gesture actually unintentional1 Paul Crouch is no man of God.